The New Zealand Labour Party has announced that it will be launching a cross-country bus tour in protest to the National Party’s proposed Good and Service Tax rate increase. Phil Goff, Labour Party leader, announced on February 22nd that a two week protest bus-tour will be launched on February 28th to fight the possibility of a the GST rate being raised to 15 percent. 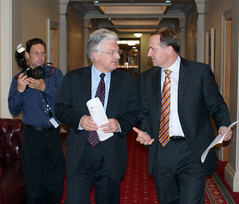 He claimed that the tour’s aim was to visit New Zealand communities and “to show them just how unfair John Key’s plans to hike GST are.” The protest plan also includes several visits to local community groups like Grey Power, Citizen’s Advice Bureau, and any local budgeting services. The Revenue Minister has stated that New Zealanders who are undertaking overseas work for Partners Relief and Development NZ may now be eligible for an interest-free status on their student loans. 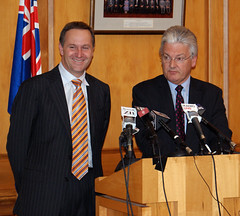 In an effort to foster a greater sense of charitable work amongst New Zealanders, Peter Dunne, New Zealand Revenue Minister, announced on February 23rd that individuals who are working overseas for Partners Relief and Development NZ will now be eligible for an interest write-off on their student loans. The change is scheduled to come into effect on April 1st. The upcoming Double Taxation Agreement (DTA) between New Zealand and Australia has taken one step towards to coming into effect after a Governmental signing of an Order of Council for the document. The New Zealand Government has begun to incorporate the DTA into the country’s law system through a signing of an Order in Council on February 17th, according to Peter Dunne, New Zealand Revenue Minister. Once the legal incorporation is complete for both nations the DTA will come into full effect. Australia is yet to commence their respective ratification process. Changes within the DTA are expected to begin in late 2010, two months after the expected conclusion of both countries’ ratification process. New Zealand Prime Minister John Key has stated that he wishes to see the country transformed into an international financial hub, focused on the administration of overseas pension funds. 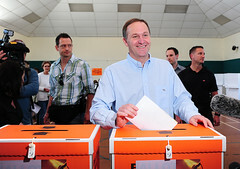 Speaking in a television interview on February 14th, John Key disclosed that the Government is investigating the possibility of creating infrastructure to facilitate and encourage the registration and administration of international pension funds within the country. The concept was suggested and detailed to the Prime Minister personally by the Capital Markets Taskforce in December 2009.